A premier Master certification is now part of the Dell EMC Proven Professional Program. New Dell EMC certifications, introduced Thursday, elevate what was EMC’s Proven Professional Program, prior to the Dell acquisition, to another level. Now known as the Dell EMC Proven Professional Program, the portfolio expands from a three-tier structure to four tiers with the introduction of a Master level credential. The vendor introduced a total of four new certifications: Dell EMC Certified Master – Enterprise Architect; Certified Expert Systems Administrator – Multi-Cloud; Certified Specialist Systems Administrator – Infrastructure Security; and Certified Associate – Converged Systems and Hybrid Cloud Platforms. The new certifications address the business skills that go hand in hand with the technology skills required for digital transformation. Dell EMC Certified Master – Enterprise Architect is the highest-level, experience-based certification. It uses a board-review process to validate that candidates have both the technical acumen and the holistic understanding of business drivers to deliver secure IT-as-a-service (ITaaS) solutions that further digital transformation. Dell EMC Certified Expert Systems Administrator – Multi-Cloud recognizes expertise in administration of multicloud solutions. This certification validates an administrator’s experience managing workloads across multicloud environments and their expertise in Dell EMC infrastructure, VMware vRealize Suite, and integrating with popular public cloud providers such as Dell EMC and VMware Cloud Provider Partners, Virtustream, Microsoft Azure and Amazon Web Services. Dell EMC Certified Specialist Systems Administrator – Infrastructure Security validates that IT professionals have the knowledge and skills to take a security-first approach to administering Dell EMC infrastructure across the data center and cloud. Administrators will learn best practices in configuring and managing Dell EMC enterprise solutions in alignment with their organization’s overall security strategy. The real highlight among the new certifications is the Dell EMC Certified Master Enterprise Architect level certification. “This [certification] moves individuals from technologists to transformational leaders, tightly aligning skill sets and capability to architect an end-to-end IT-as-a-service solution at company level,” Atkins said. The robust Master Enterprise Architect certification has steep requirements – such as the aforementioned board-review process – to validate business and technical acumen, holistic understanding of business strategy and goals, knowledge of both IT service and financial models, and extensive experience building modern, secure ITaaS solutions. This certification requires about 15 years of industry experience, according to Mike Apigian, senior director, product development, Dell EMC Education Services. There aren’t currently any requirements for Dell EMC partners to get the new certifications, but the Master-level certification could well be a differentiator for partners who opt to pursue it. “Transformational certification capability starts to broaden the conversations partners have with customers, as they [customers] are trying to work through the digital evolution that they’re struggling with,” said Atkins. Dell EMC recommends that partners pursue the new certifications. 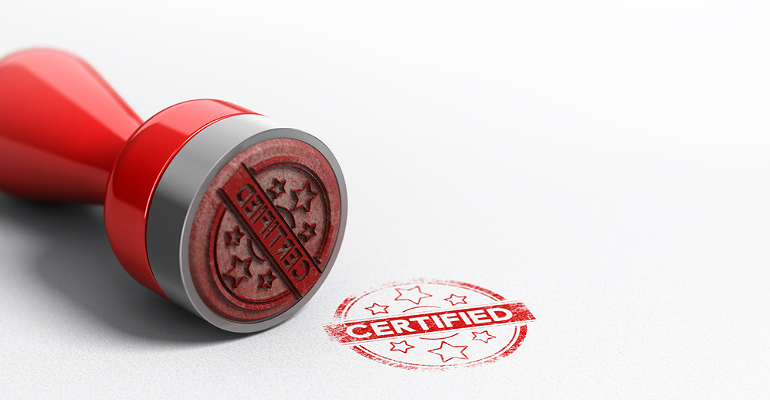 For this fiscal year, the certifications aren’t required as part of the Dell EMC partner program; however, the company’s accreditation team will review certification compliance for the next fiscal year and beyond. Partners should contact Dell EMC for more details about a road map and requirements for the new certifications. The Master Enterprise Architect certification is available today, availability for the Certified Expert Multi-Cloud is April 30, and in June, the Certified Specialist Infrastructure Security becomes available. The Certified Associate Converged Systems and Hybrid Cloud Platforms credential was rolled out in mid-December without much fanfare. VMware Certified Design Expert (VCDX) and Dell EMC Certified Master Enterprise Architect can be combined as a Dell EMC and VMware Co-skilled Master Badge.